I would love to win with the Hot Potato Blogger Challenge because I could really do with some good news! I first had a potato curry at a friend who had made a lot of traditional Indian dishes for us to try. Hers was mild and pleasant and so for one of my potato recipes I decided this would be high up on my list. The weather this past weekend was perfect for a curry as it was cold and wet. I needed something warming to eat and this curry completed the bill perfectly. 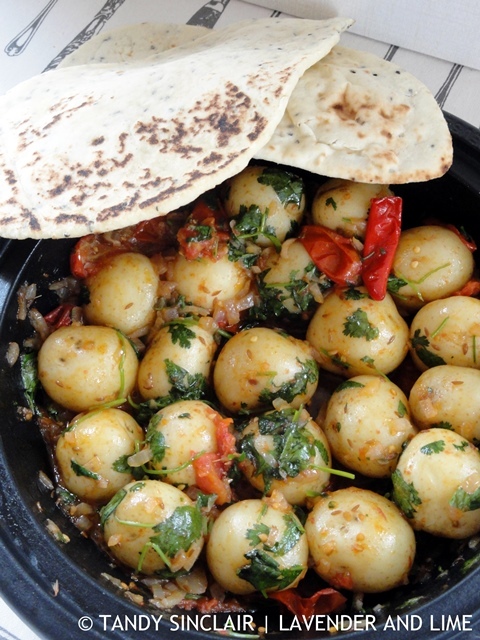 This dish is from Pakistan and should be served with apple chutney and nan bread. I used 2 chillies in my recipe – the original calls for 8 – and it was a bit too hot for my palate. I added crème fraîche to the potatoes to cool it down as I did not have any yoghurt in my fridge. I will make this again, with only one chilli next time, and I think a coriander raita will be perfect to serve alongside the allloo curry. This very hot curry can be served alone for vegetarians, or as a side dish. Disclosure: I was invited to participate in this competition. I was provided with the potatoes I needed, together with additional pantry ingredients and vouchers to the value of R400. This post is in line with my blogging policy. Love that you left them whole! I want to try potato samoosas now! Thanks Juliana, and you too! I’ve never had anything like this- it’s so pretty and delicious looking! 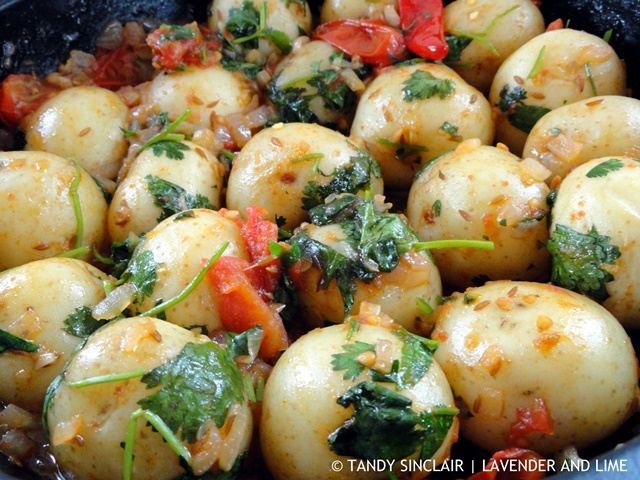 Oh, I do love Indian food and Alloo Curry is always a favourite – yours looks fab – Tandy! Good luck with the contest! These would be a winner in my book no matter how you cut it! I love potatoes! I think I would prefer the crème fraiche than the yogurt, but that’s my personal taste. Hi Tandy, I just started enjoying Indian food this year and now I have many favorites, this looks delicious! I gre up eating potato curry – my mom makes so many variations of it – from mild and with a lot of “gravy” to super spicy, with no “gravy” – so, I am drooling all over my screen looking at this, Tandy! Shashi, I think I need to try your mom’s recipe for mild with lots of gravy! This is one of my favorite kinds of curries! This potato curry looks delicious Tandy, but I think I’ll take your advice and use 2 chillies instead of the original 8. I have a pretty weak palate for “hot’ items. Just can’t take the heat. Mmmmmmmm! I love potato salad, especially digging the different flavours in yours. Its nice to see a pot salad without cream.